This is a tough one. I’ve actually been thinking about this one all day (it helped pass the time at work) and still don’t have a specific book in mind, so I’ll do my best to talk about one I’ve loved: The Autobiography of Santa Claus by Jeff Guinn. This one is a sweet Christmas tale that reignited the spark of belief for me (& my husband, whom I made read it, too). Yes, I do still believe in Santa Claus. Yes, I’m 34 – age is irrelevant. Anyway, Jeff Guinn expertly weaves an enchanting tale throughout our world’s history, blending the magic of Santa Claus with real people and places. Check it out. (No; I do not get any kickbacks for mentioning the book.) I read The Old Man and the Sea by Ernest Hemingway when I was in high school, and it’s stuck with me all these years. The struggle and determination … the heartache. If you know the story, you know what I mean. If you haven’t read it, you might want to put it on your TBR list. Lastly, GATSBY! This is another one I read in high school – except back then, I despised it. I just didn’t understand any of it. My mind was not ready to look at The Great Gatsby the way it was intended by F. Scott Fitzgerald, so when I had the chance to study it again less than a year ago, I fell in love. 2. What’s the best thing about winter? Everything. Hot tea, books, big sweaters, the way the air smells just before the snow starts to fall, fluffy scarves, the way the snowflakes make the night all the more quiet, floppy hats, the sparkling ice-covered tree branches, the crunch of frost under your boots, looking close enough to see the beauty of a single snowflake. Unfortunately… I don’t get any of those things here in the South. 3. What wild animal do you relate to, and why? I’d say owl. I do my best work at night (sometimes I forget that I’m supposed to sleep) and I love spending time alone. Don’t get me wrong – I love my family, but I need that alone time to rejuvenate. Does it have to be a real animal? Because my next answer would be dragon. “Duck billed platypus because you, like God, have a great sense of humor.” – Anne C.
“Arctic wolf. You’re one of those cold weather/ pack creatures.” Christ P.
“Tiger. You’re very majestic and love lounging and reading in cozy places. You prefer not to get into other people’s business… But don’t let someone mess with your babies…” Sarah H.
4. What’s one of your favorite things about your city/town/part of the country? Honestly… my favorite thing about this part of the country is: we will be moving away from it within the next year. 6. What’s one movie that you love? 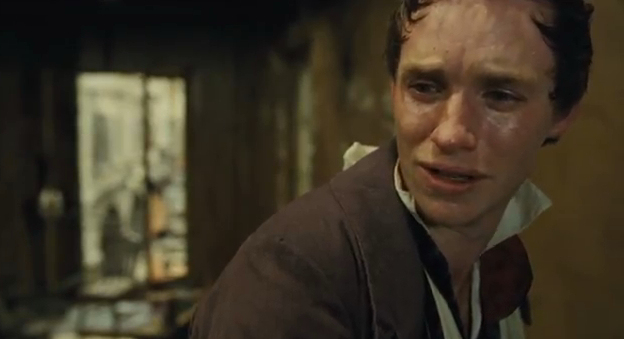 Les Miserables – the Hugh Jackman/Eddie Redmayne version from 2012. I’ve probably watched it a hundred times, and every single time, Eddie’s rendition of “Empty Chairs at Empty Tables” KILLS me. Every. Time. 7. What’s one song that gets you motivated? Shadows by Lindsey Stirling (Actually, almost any of Lindsey’s upbeat pieces!) Great for running, getting the housework done, or focusing on school work & writing. Also, Carry On My Wayward Son by Kansas. 8. If you could travel to one time and place on earth, when and where would you go? I’m not indecisive, I just want to be in all of these places. 9. If you could spend some time in any fictional world or story, what would you choose? 10. What’s something you’ve gotten way better at over time? It could be a tangible skill or more of a personal thing… big or small! Anger. I’m an Aries (enough said, right?) and my service in the military unlocked an explosive temper I never knew I had. It’s been a few years, but I’ve learned to control it (still learning) and look at the bigger picture. Instead of immediately getting angry and reacting negatively, I take a step back and consider all sides of the story/incident. No one likes being angry, and no one likes being the target of anger, either. My first writers’ workshop (in Atlanta later this month), getting back into running (I miss my half marathons), and visiting Pennsylvania over my son’s spring break. The end of the year is up in the air – we have no idea where we’re going and won’t know anything for a long time. That’s military life for you. 2. What one thing do you want most in the world? 3. Name one thing about yourself that you are proud of. 4. What book have you read that you would recommend as a must-read (& why)? 5. How do you rejuvenate? 7. What are you goals for 2016? 9. If you were a color, which one would you be? Why? 11. If you had the chance to spend one day with anyone in the world (past or present), who would you choose, and why? That’s it! Anyone else who wants to answer any of these questions, leave your answers in the comments. I’d love to see them!